The best way to remove minor scratches, swirls, and scuffs on all of the high polish / mirror finish areas on your watch. These pads remove scratches and scuffs and produce a perfect OEM factory brushed / satin finish. They are exceptional for restoring bracelets, clasps, and cases to new condition. 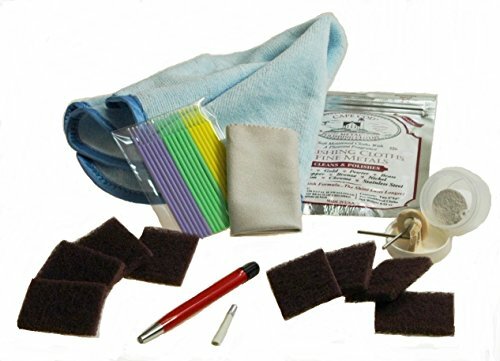 Designed for use in Roto / Flexshaft / Micromotor / Dremel tools, these buffs, used with white rouge; are the safe and effective way to remove deep scratches and scuffs and prepare the surface for final finishing with either a Cape Cod Cloth or one of the finishing pads. This is the perfect polishing compound for removing deeper scratches and restoring the surface to perfect condition. If you have any questions about this product by Watch Details, contact us by completing and submitting the form below. If you are looking for a specif part number, please include it with your message.